Professors Kurt Gohde and Kremena Todorova have ventured from the corner of Third and Broadway to create art projects that are far from what you might associate with Transy. 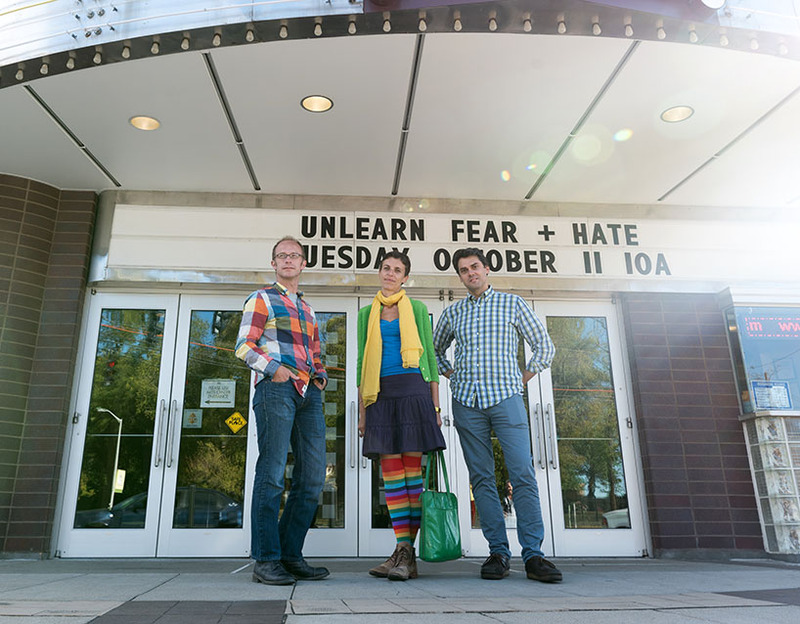 Their new project, Unlearn Fear + Hate, also takes shape off campus—for instance, as a metal halo bearing the message attached to the 21c Museum Hotel in downtown Lexington. But the saying was so powerful and timely that Transylvania incorporated it into the very fabric of this academic year—from endowed lectures to an embroidery project. Todorova, associate professor of English, didn’t want unlearn fear and hate to become just words that students occasionally heard about something going on “out there”—a noble idea, of course, but not terribly meaningful to them. Gohde, professor of art and chair of the Fine Arts program, was on board with that. “We’ve never done anything where the whole campus community was involved, and that was a really exciting idea,” he said. The message is so contagious that it's spreading organically, outside of organized events. A way to make a positive impact on the world is to expose students to speakers who are deeply committed to unlearning fear and hate. This academic year, a series of lectures includes acclaimed poet Claudia Rankine, whose work deals with race issues, and author Robert Gipe, who tackles Appalachian stereotypes and marginalization. Additionally, the Morlan Gallery will showcase Affrilachian artists and poets. Paden sees these talks and artworks as transformative—a way to move past fear and hate. “Listening and understanding play a key role in knowing the point of view of the other,” he said. The theme will extend into the classrooms this year as well. Course titles include Philosophy of Disability; Politics of Identity; and education classes such as, The Immigrant Child, and Race, Ethnicity, Social Class. Even a course as seemingly unconnected as professor Paden’s Cervantes will continue the theme. The novel “Don Quixote” consistently brings up the treatment and marginalization of women and Moors in 17th-century Spanish society; it’s a conversation that functions as a window through which students can refract their own experiences, he said. Beyond the coursework, Unlearn Fear + Hate will include social hours and book conversations hosted by the Diversity Subcommittee—and other, more unexpected events. “Listening and understanding play a key role in knowing the point of view of the other.”—Jeremy PadenMembers of Transylvania’s Greek community have planned to gather in the Campus Center Gym in November to cross-stitch the message into fabric according to a design by a local activist. They hope to donate their creations, perhaps to children at local hospitals. Regardless of the message, the image of fraternity brothers embroidering in itself breaks down stereotypes, said professor Todorova. Involving the Greeks helps engage as many students as possible. After all, the further the saying spreads, the better society as a whole will be, she said. Todorova and Gohde kicked things off on campus during August term. They spoke at a gathering of all first-year students, and then they drew a large crowd to stencil the words on Bourbon Avenue near a university parking lot. Student Cubaka Nehemia Mutayongwa, who is from the Republic of Congo, attended their lecture and participated in the stenciling. Then one night, as he and some friends returned to campus after a late pizza run, he saw the opportunity to put the idea into practice. The group had noticed two men standing under a nearby streetlight, and this made them feel uneasy. Mutayongwa’s friends disappeared, but he instead decided to engage the strangers in conversation because, as a refugee from wars, he didn’t want his sense of campus to be a fearful one. Funnily enough, the men on the corner were professors conducting research on bats. Mutayongwa laughed as he recalled how reality had disarmed his unjustified fear. “I like that the university brings me some of these challenges,” he said.